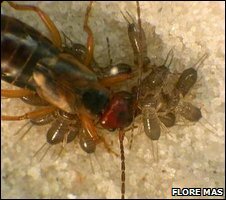 Earwig mothers sniff out their "best" offspring and lavish them with care, according to new research. The insects pick up odours from their clutch of "nymphs" and adjust their maternal behaviour in response. When they pick up a chemical signal from healthy, well-fed youngsters, they spend more time nursing them, at the expense of their hungrier babies. 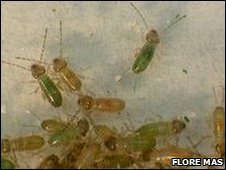 The study, which is the first to show this behaviour in insects, is published in Proceedings of the Royal Society B.
Earwig parenting, it seems, is about favouritism; the standard of care drops dramatically when mums pick up the chemical signals from hungry, unhealthy nymphs. In these cases, the adults invest less time and effort in feeding. The researchers, who expected to see the opposite result, suggest that this could be "because the insects look for signals of quality instead of need". "These insects have a clutch of 30-60 offspring, and there is lots of mortality," explained lead researcher Flore Mas from the Zoological Institute at the University of Basel, Switzerland. "So there is no point investing (resources) in offspring that are already in bad shape." While communication via chemicals is common in social insects, this study is the first to show exactly how they have evolved to employ it in parenting. The team that carried out the study explained "begging signals" were well recognised in the avian world - hungry chicks opened their mouths widely and made specific sounds that were recognised by their parents to mean "feed me". "So we expected to see the opposite of what we found here," said Ms Mas. Her team tested this signalling by exposing earwig mothers to odours from well-fed and poorly-fed nymphs, and comparing their reactions. "We made a chemical extraction using the nymphs," Ms Mas explained. "They were divided into two groups - one group was given lots of food and one very little food." These two experimental groups of nymphs were then killed and dipped in solvent to extract the hydrocarbon chemicals from their bodies. The researchers then used these chemicals to make miniature sensory chambers - pieces of nymph-scented filter paper placed in dishes. Earwig mums, who were still feeding nests of their own young, were then put into these dishes. "They were presented with the chemical extracts, or to a control solvent, for 30 minutes, and were then allowed to forage in a dish of food for an hour before being returned to their nests," Ms Mas said. The insects feed their young by regurgitating what they eat. By dyeing the food with green colouring, the team was able to see the food in the abdomens of the transparent baby bugs. Weighing the dish after the mothers' foraging trips also gave them an accurate measure of how much effort the insects were putting into their foraging expeditions. Gary Blomquist, professor of biochemistry from the University of Nevada, started investigating the role of "insect hydrocarbons" more than four decades ago. He explained that the chemicals were involved in many forms of communication, including gender recognition, dominance and fertility cues. He told BBC News: "It does not surprise me that an additional function, that of offspring quality affecting maternal care, has been determined for [these] hydrocarbons." But, Professor Blomquist added that when he started working in this area, no one could have predicted the large number of different and important roles that insect hydrocarbons would have in communication.